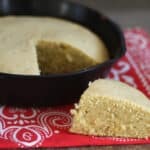 The Best Cornbread Ever is moist and sweet, while being just dense enough not to fall apart in your hands. There is no need to slather on butter and drizzle honey over this cornbread, the cornbread is lightly sweetened and delicious on it’s own. (Not that it won’t be even more delicious with any and all of your favorite toppings!) Almost every time I make this, I hide a piece just for myself the next day. To say that I love this cornbread, just doesn’t even do it justice. With bread recipes, it is often all about the texture for me. This cornbread is not too crumbly at all; it holds together beautifully. I’ve even baked it in a loaf pan and sliced it more like sandwich bread. I made the traditional version of this recipe for over ten years and I’ve now made the gluten free version for over two years. 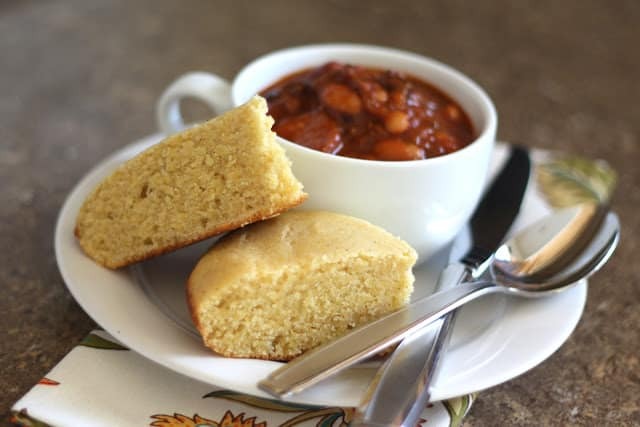 This cornbread has never failed to get great reviews from everyone who tastes it. In the bottom of a mixing bowl, whisk together the milk and cornmeal and set aside. Let the mixture rest for 15 minutes. While this is resting, mix together the flour, baking powder, and salt and set aside. Bake 25-30 minutes until a knife inserted in the center comes out clean. The bread should be lightly browned at the edges, dry on top, and just beginning to show some cracks in the crust. Slice and serve hot. Enjoy! The secret to this cornbread is in the method. 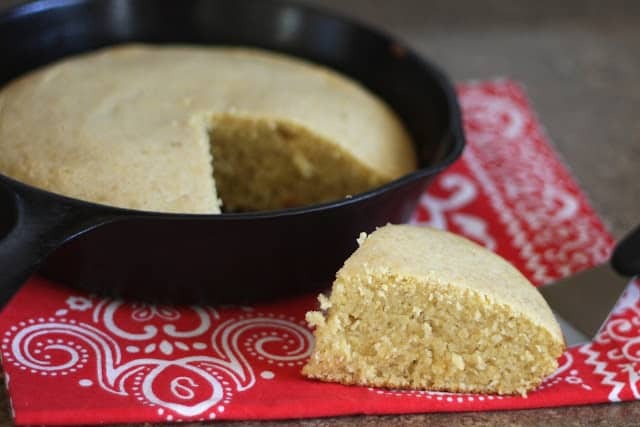 The soaking of the cornmeal combined with the beating process makes this the amazing cornbread that it is. Don't let the slightly longer process deter you from trying this. This is a simple and straightforward recipe: soak, stir, beat, and bake. The extra step is worth it! 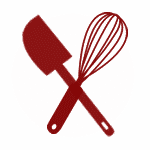 Whether you are baking a gluten free version or not, be careful to follow all of the steps in the directions. I just found this recipe & it looks delicious. By the way, that gum is "xanthan" - not "xantham". oh. my. goodness. You are correct! I always pour it into my canister when I buy it, so I never have the packaging on hand to reference. In five years of baking gluten free, I have never noticed I was spelling it wrong!! Thank you so much. Yikes. I have a lot of editing to do. Why would the oil and eggs have to be beaten for ten minutes? It isn't just the oil and egg, it is the final step of the ingredient list. The other ingredients are combined, then the oil and the egg are added and everything is then beaten together. I don't know the science behind the extended mixing period, but it absolutely works. I've skipped the 10 minute mixing step before and the difference is noticeable. I hope that helps explain it! Can you use a gluten free all-purpose baking flour for this receipe? How about making muffins instead of in a loaf or cake pan? Thanks for the advice! I haven't tried that myself, but if it's a blend you've had success with in the past, it should work fine.